Our minimum intake should be 8-10 glasses so about 2-2.5 liters per day and for women who are highly active or breastfeeding or both that minimum should be even more. 1. START YOUR DAY WITH WARM WATER WITH LEMON. The first thing that should hit your mouth in the morning should be a warm glass of water with a half a lemon squeezed in. Add in some apple cider vinegar for extra benefits. The lemon and/or ACV help aid with digestion, give your metabolism a kick-start and will stop you from feeling bloated. 2. DITCH THE MORNING (or at least the second) COFFEE FOR A HERBAL OR FRUIT TEA. Starting your day with a herbal OR fruit tea instead of a coffee with your breakfast will help you feel a lot calmer heading in to the day and by having a fruit tea such as Red Seal Fruit Tea they are non-caffeinated so you won’t be dehydrating yourself and this cuppa will add up in your daily intake of water. 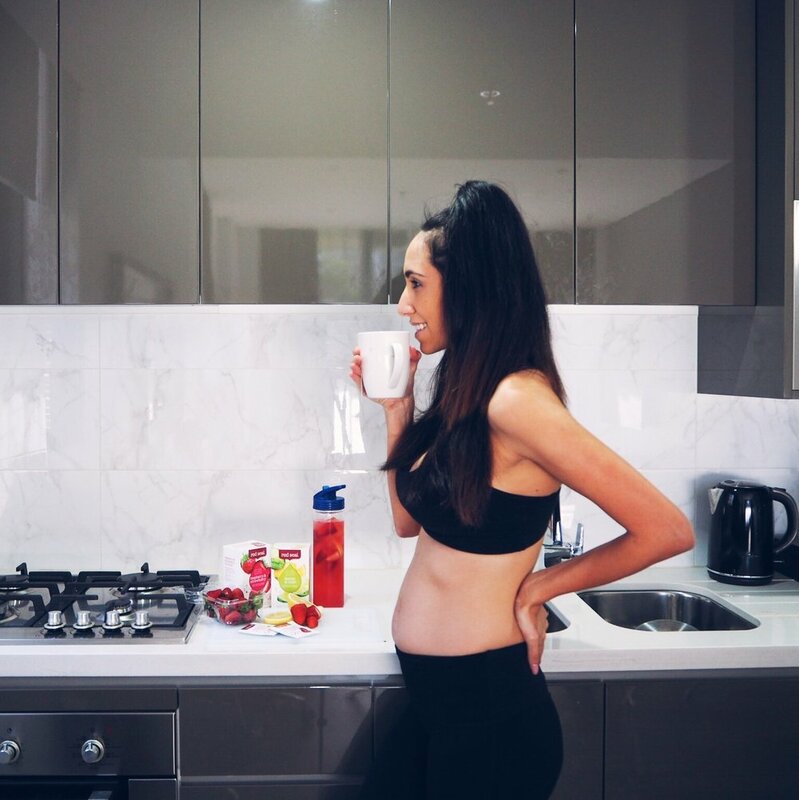 This is also a perfect option for breastfeeding mums whose babies react to caffeine or dairy in their breastmilk. 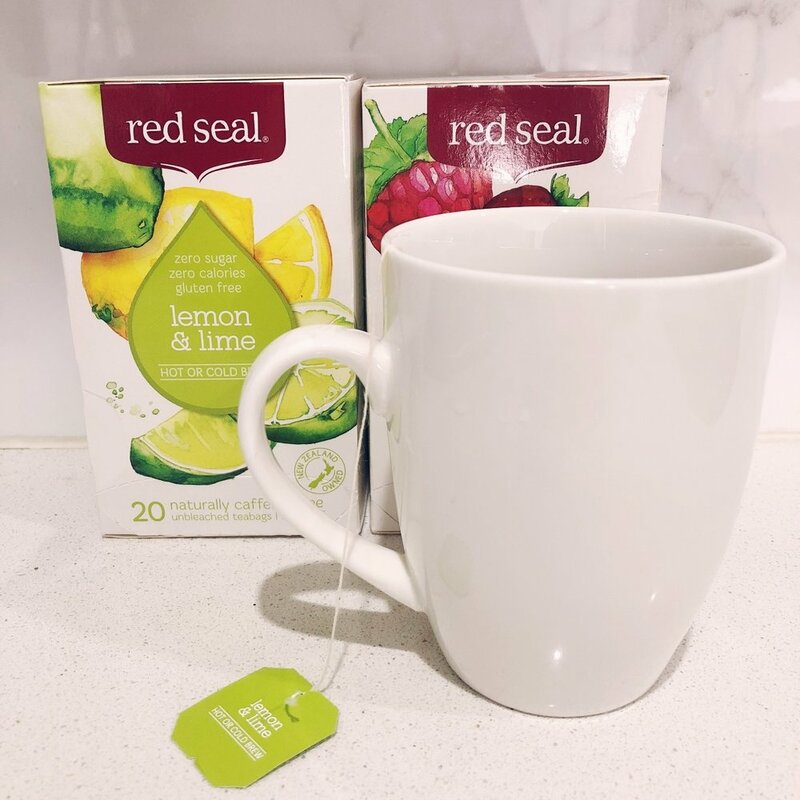 Recently I have been drinking the “Red Seal” brand fruit teas and for a morning blend I find the lemon/lime flavor helps makes me feel a lot less highly strung rather than the couple of coffees I usually have. One of the most common reasons I hear that people can’t get their daily intake high enough is because they simply find water boring to drink so therefore reach for a sugary fizzy drink or juice to satisfy their tastebuds rather than actually staying hydrated. · In one litre of room temp water brew 2-3 Raspberry & Strawberry Red Seal Tea bags. · Add some freshly chopped strawberries, whole blueberries and chopped lemon wedges. · Add a handful of ice. · Keep in Fridge to sip throughout the day or pour in to a drink bottle to have on-the-go/at work or on your desk at home. Tip: Also really yummy with the peach & pineapple flavor with some chopped pineapple or oranges and lemons. A lot of the time we think we are hungry between meals when really it can be a sign of dehydration. When those 3pm sugar cravings kick or any other time of the day when you’re hungry again after eating not too long ago try having a glass of water (or your iced tea) and waiting 10 minutes. If you’re still hungry grab a healthier snack option such as a handful of nuts, a piece of fruit or some veggie sticks and hummus. I know this sounds extreme but your daily intake of water is so super important especially if you’re feeling run down lately, if you suffer from headaches, digestion issues or you’re pregnant/breastfeeding. Set a reminder every couple of hours to drink some more water and keep track of it in your phone either just in your notes or with an app such as “My Fitness Pal”. After a week or so you will notice you probably won’t need the reminders and that you’re in a good habit. If you’re breastfeeding a good reminder time can be when you sit down to feed your baby – grab a glass of water or a fruit tea such as a Lemon & Lime flavour to drink while feeding. Who’s guilty of craving something sweet after dinner? Who is also guilty of getting to the end of the day and realizing you haven’t had enough water? Instead of reaching for the milk chocolate bar try having a nice warm cup of fruit tea – you might find that you’re not actually still hungry but in fact you’re thirsty. If it doesn’t at least you’ll have a yummy tea to have with your dessert and you’ll be adding up your water intake. 4 squares of 70% dark choc, a handful of fresh raspberries and/or strawberries. A cup of Raspberry & Strawberry Red Seal Tea. “Red Seal is a health and wellbeing brand. With a rich New Zealand heritage, Red Seal has been committed to delivering natural alternatives across a variety of categories since 1923. Importantly at Red Seal, we believe maintaining good health should be accessible and affordable to everyone. – Taken from Red Seal Website. Red Seal Tea fruit teas are unique as they can be brewed in either hot or cold water meaning you can enjoy them on a cool winter’s night or warm summer’s day. This blog was written in collaboration with Red Seal but I would never promote anything I don’t love or use myself. Give the teas a try and I’m sure you’ll agree they are delicious!